Loudmouth Golf About Us - The Most Fun You Can Have With Your Pants On. 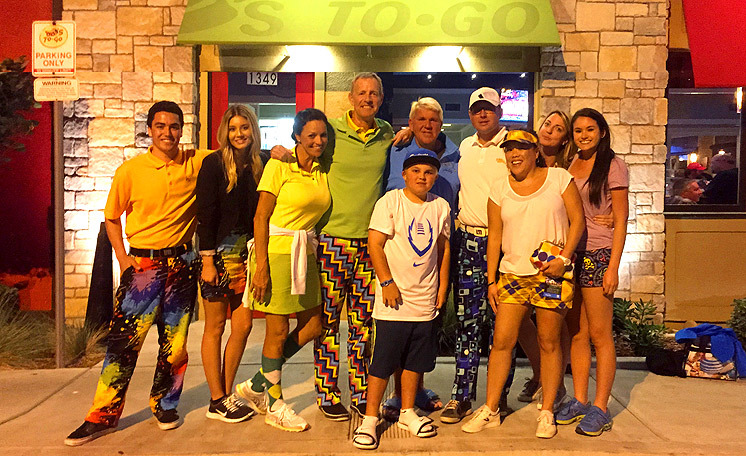 Loudmouth partial crew at John Daly's favorite Mexican Restaurant, Chili's (because it has great Diet Coke). This was taken after John Daly shot an opening round 65 at Pebble Beach, February 2015. L to R: Bailey (2nd Loudmouth employee, when he was 8 yrs old), Kyleigh (new customer service rep), Anna (JD's fiancee and caddie), Woody!, Big and Little John, Halldo (sales operations), Marcie (cat herder), Cassie (celebrity liaison), Sierra (wholesale, product model). Loudmouth is for those who want to stand out, smile and have fun. It all started in 2000 when founder Woody! decided to make his golf outings convivial occasions and produced a pair of powder blue pants with Bugs Bunny on them. It wasn’t long before this tongue-and-cheek fashion statement took on a life of its own, and he realized there was a hidden desire on the golf course… to play LOUD! With a team of business partners, the brand has grown internationally from the United States to Canada, Asia, Europe and Australia. Today, Loudmouth is the most recognizable golf brand in the world and is rapidly expanding into the fashion and lifestyle industries. Loudmouth's vibrant prints and bold patterns can be instantly spotted and are always a great icebreaker for any conversation. Loudmouth is worn by many athletes including two-time major winning golfer, John Daly, professional golfer, Pornaong Phatlum, 2nd world-ranked darts player, Peter 'Snakebite' Wright, and the Norwegian men's curling team. Loudmouth has been featured on The Today Show, Good Morning America, NBC Olympics, The Wall Street Journal, ESPN.com, Golf Digest, SportsCenter, Sports Illustrated, The Ellen Degeneres Show, TIME Magazine, The New York Times, WIRED Magazine, SB Nation, BBC, Conde Nast Traveler, American Idol, FOX Sports, OK Magazine, Glamour Magazine, Vanity Fair, Cosmopolitan Magazine, Lucky Magazine, ABC News, The Associated Press, CNN, several major motion pictures, TV shows, and more. The company is lead by a team of industry professionals who all claim to be the best golfer at Loudmouth Golf.